A detail from Augustus Saint-Gaudens’s bas-relief Shaw Memorial. They marched past the home of Wendell Phillips, where the abolitionist William Lloyd Garrison reportedly stood with his hand resting on a bust of John Brown. They continued down Beacon Street, past crowds of curious well-wishers, pausing briefly at the home of Robert Gould Shaw, their 25-year-old colonel, already a veteran of Antietam. Mounted on horseback, Shaw raised his sword to salute his abolitionist parents and young bride. The soldiers continued into Boston Common, where they marched past a reviewing stand that included the governor and the mayor. They were, of course, the 54th Massachusetts Volunteer Regiment. President Lincoln had signed the Emancipation Proclamation less than five months earlier. In response, Massachusetts Governor John Andrew had solicited the support of a number of prominent African-Americans and abolitionists — among them Frederick Douglass, Amos Lawrence, Garrison, and Phillips — to urge men of color to enlist in a new, all-black regiment. Sebastian Smee’s picks for art exhibitions on view this coming week, including “Permission to Be Global/Practicas Globales” at the MFA. They were promised a $100 bounty to be paid “at the expiration of the term of service” and $13 a month (a sum less than the pay offered to white soldiers, which was later the subject of contention). Thirty years later, a ceremony was held on Beacon Street — Booker T. Washington and William James were among the speakers — at the foot of the same State House the regiment had marched past. A statue by Augustus Saint-Gaudens honoring Shaw and the soldiers who fought under him was officially unveiled. It stands there today, the most poignant — and important — work of public art in Boston, and now the subject of an exhibition organized by the National Gallery in Washington, D.C., and installed, through May 23, at the Massachusetts Historical Society on Boylston Street. The soldiers of the 54th hailed from 15 Northern states, all four border states, and even Canada and the West Indies. Saint-Gaudens sculpted them with sensitivity, imparting a dignity and fullness of being that are immediately apparent. He gave them individuated faces and powerful, rhythmic strides, paying careful attention, too, to their uniforms, rucksacks, rifles, and rolled up blankets, so that in the finished work, each regulation-issue item takes on a kind of talismanic glow. But unlike the figure of Shaw, whose face Saint-Gaudens based on photographs supplied by his family, these soldiers remain anonymous. Shaw, who was leading the charge, survived this first barrage. He and his 23-year-old African-American sergeant, William Carney, reached the parapet and began to climb it. Shaw cried out “Forward 54th!” but was promptly shot dead. Of the 600 who participated in the assault that evening, more than 280 were killed, missing and presumed dead, or wounded. It was a rout, and a tragedy. Except that, in a war that had already heaped massacre upon massacre, tragedy upon tragedy, this one seemed from the outset to carry a higher meaning. 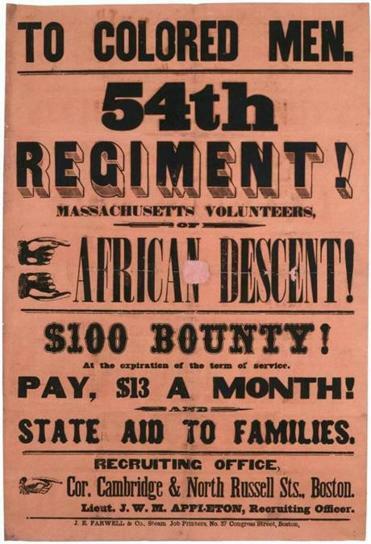 An artifact of the Civil War period, a recruitment poster for the Massachusetts regiment. Working more than 20 years later, Saint-Gaudens had a difficult brief. A single equestrian statue of Shaw had been proposed. But Shaw’s family was acutely conscious both of the historical significance of the regiment’s formation and of the fact that their son had been a mere colonel. So they asked the sculptor to show Shaw “bound together” in common cause with his men. By and by, Saint-Gaudens, in his own words, “fell upon a plan of associating him directly with his troops in a bas-relief, and thereby reducing his importance.” The result is really a wonder of late-19th-century art — one of the strongest, most original, and most moving public memorials anywhere in America. 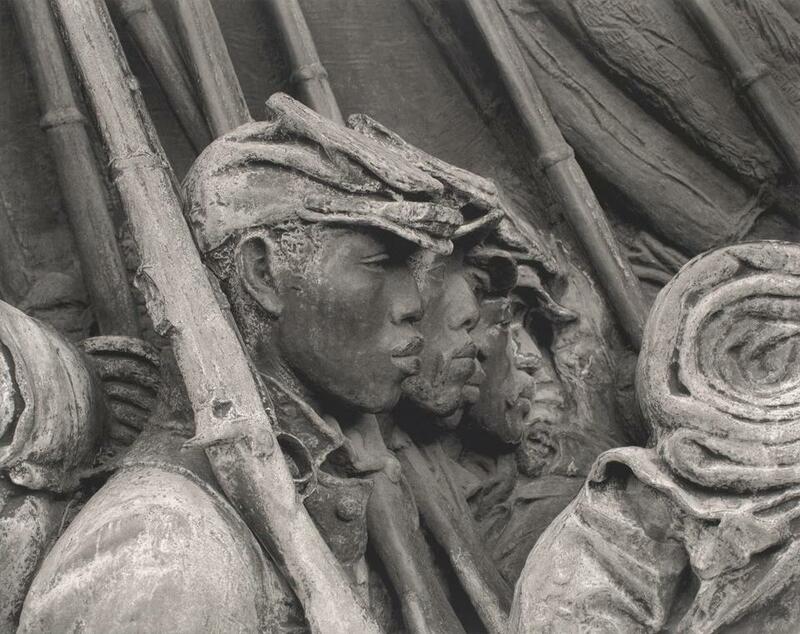 Since Saint-Gaudens had to hire African-American men as models, the soldiers themselves remain essentially unknown. So this show’s primary aim is to give them, as much as possible, names and individual histories. It does a good job of it. The curators, Sarah Greenough and Nancy Anderson, both of the NGA, have relied greatly on photographs that these new volunteers, momentously attired in their brand new uniforms, had made of themselves and sent to loved ones before going off to battle. These photographs, made to be sent out into the world, capture intense moments in these young men’s lives, moments fraught with extremes of emotion: fear, pride, relief, and something almost impossibly fragile, something these small and delicate prints seem somehow to embody, but which remains beyond words. Also in the show are Carney’s Congressional Medal of Honor, a letter from Corporal James Henry Gooding to President Lincoln asking for equal pay, an enlistment poster, an enlistment roll, a casualty list from the assault on Fort Wagner, an early copy of the Emancipation Proclamation, and much else besides. 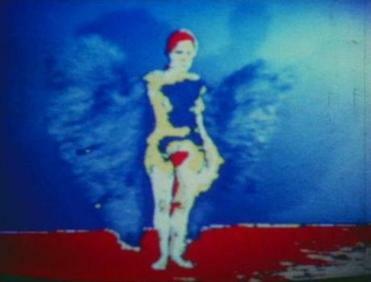 It should be missed by no one interested in either art or history.